We most typically print custom wall murals that are based on photographic imagery or artwork. 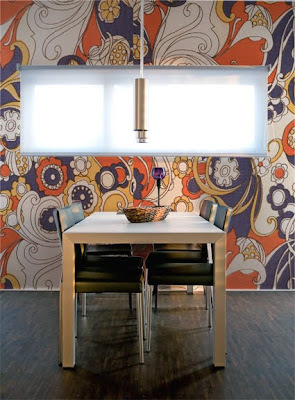 But one source of custom wallpaper inspiration we love to recommend is vintage fabric. Be it art deco-inspired prints from the 20's, or funky psychedelic prints from the 60's and 70's, you're bound to find some interesting options. It's fun to play with the scale of the pattern you select. While a small scale pattern may appeal to you immediately, we like when the size of the pattern repeat is exaggerated, created a larger than life wallpaper design, such as the custom wallpaper shown in our inspiration room.